Recently, Just4keepers hosted only our second 5 day goalkeeper residential with goalkeepers and goalkeeper coaches coming from 9 countries. 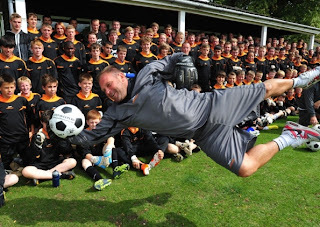 This was an amazing weeks goalkeeping and already 50% have paid their deposit for 2012! J4K Coach Ian Pledger in Action!!!! Listen to this interview from the sun Magazine on Matt Gregg who runs J4K in dublin... Brillant. Once on this page, please remember to click the play button. You will not believe how many emails i get about this topic. Alot of my goalkeeper students are worried that being superstitious before a game is bad. Too be honest, its not and probably every sportsman, even the great sportsman and women of our time have all had a certain bit of superstitious! I prefer to call this routine! Before i played a game as a professional goalkeeper, from the day before I had a set rountine. even as i got change before the game, EVERY item I put on first was left. Even when i taped my socks up, it was always left first! As i watched my fellow team mates also change for the game, i noticed that they too had a routine while they got changed for the game. In fact, I had a team mate who had to run out LAST as we ran out onto the pitch, then we signed another player who also wanted to run out last. They actually nearly come to blows in the players tunnel because non of them would be prepared to run out second to last. So (seriously) they agreed to run out shoulder to shoulder before each game. mad but true. So if you think you are superstitious, do not worry as I actually think this is a good thing because you are telling your mind you are preparing for a game, which can only be a good thing! One of my students contacted me recently worried about what his team gk coach was doing with him. The Gk coach basically had him goal and with a tennis racket, from different angles and distances smashed tennis balls at him. He asked me, was this good? is some gk coaches cannot serve very good, and improving as a young goalkeeper is all about the quality of service you get from your coach. materials, like the gk rebounder, deflection balls, tennis rackets, etc, these have to be used in moderation. I am all about making my training session as realistic to a gmae situation as i can, and for example, you do not face a shot from a gk rebounder in a gme situation. 2: Ask him, what are the benefits (a good coach will explain, a) the benefits and b) more importantly how it would benefit uou in a game situation. I hope this tip helped?